Great recipes loved by your favorite stars. In a large saucepan mix together brown sugar, margarine, corn syrup and salt. Boil over medium heat to hard ball stage on a candy thermometer (about 5 minutes). Take off burner and stir in soda and vanilla. 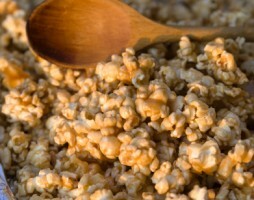 Put popcorn and peanuts in a large roaster and immediately pour syrup mixture over top, stir to coat. Bake 45 minutes to 1 hour at 250°F. stirring every 15 minutes. Copyright © 2019 StarBakers.com All Rights Reserved.